Find, evaluate and onboard high-quality suppliers and brands. Our sourcing network does the work for you, with supplier information and capabilities validated, curated and consolidated. You’ll quickly go to market with new product assortment and fulfillment capabilities. Sourcing through SPS Commerce is a powerful solution for retailers seeking to significantly grow their assortment. Gain access to more than 35 million UPCs. Find, evaluate and onboard suppliers. The SPS retail network has over 70,000 vendors, brands and carriers. Significantly reduce cost and time of vendor discovery and acquisition. Leverage validated vendors with diverse capabilities and fulfillment models. Filter by categories, fulfillment model, location or technical capabilities. 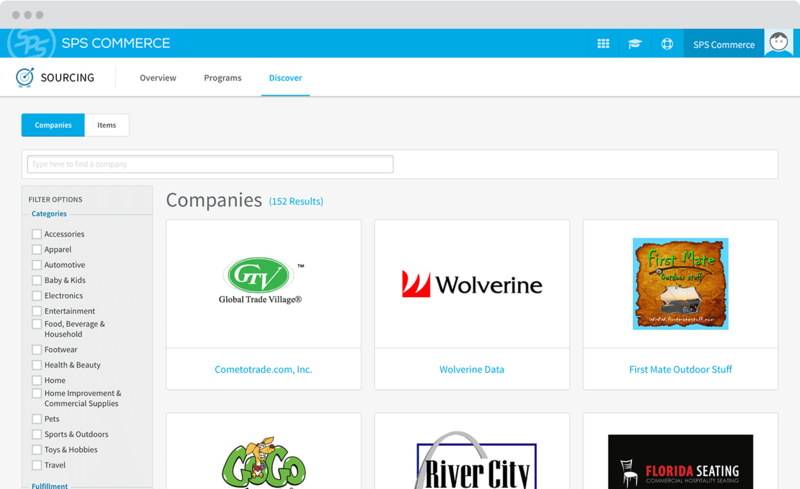 You can search and browse by company or by item. Quickly learn about a potential partner by viewing their company profile. See capabilities, geographic markets, company stats or item catalog. 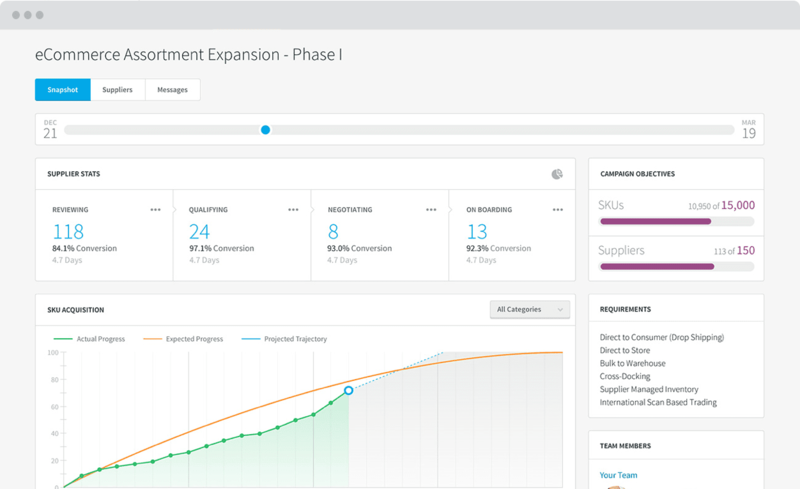 Visit your campaign dashboard at any time to see the status of your Sourcing program. SPS Commerce sourcing is an end-to-end source to fulfill solution. will help you define target markets and channels, the assortment expansion roadmap and the ideal vendor profile specifics. is then kicked off. Retailers see fast and high quality results due to SPS’s reach to a massive number of validated vendors. SPS will test, certify, and onboard the vendor to compliance with your unique requirements and policies. 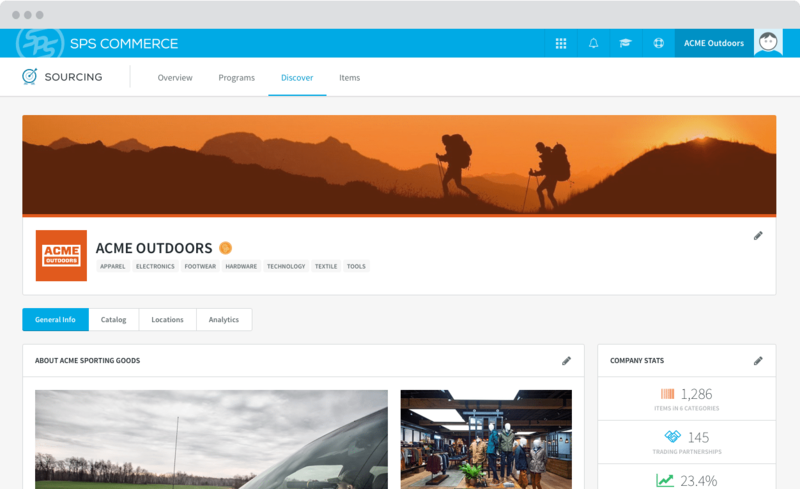 SPS Commerce introduced us to qualified vendors that we didn’t know existed but were a perfect fit for our merchandising strategy. The solution has streamlined our sourcing process by relying on SPS to identify and pre-screen vendors. Quickly go to market with new products and fulfillment capabilities. Our retail strategists are ready to help you develop a comprehensive and actionable sourcing plan.